This saw dates from the Second World War era and I inherited it from my father. I cannot find a model number on it but according to this site it would be a BN730. The serial number is 7896390. I have replaced the tires recently (the first time they had been changed). The saw works well but doesn't have any of the modern features like a tension indicator and changing the blade is a bit tedious but I am proud to keep this machine in working order and it does everything I want it to do. I do have to have blades made to order because the modern machines (even if they are 12") have different wheel spacings. 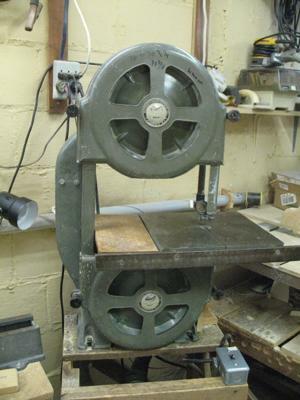 Walker Turner BN730 Band Saw - A Great Saw! I inherited my BN730 from my father who rarely used it. It was originally purchased by my great grandfather who passed it on to my grandfather. Both used it regularly as they were heavily into woodworking. It still still works great. I have not been able to find new blades but just replaced the original tires with urethane that I puchased on-line from McFeely's. The set of 2 were only $29.95. They work perfectly and were easy to install. This is a Great saw I just acquired one made for Craftsman in 1938 by walker Turner it sold for 29.00 dollars at the time of production in the Sears Catalog. The walker turner model is Bn730 I just measured the wheel yesterday it will take a 78 inch blade with the tensioner down.I need to fine some new tires for the 12 inch wheels. Mine has a Packard motor made by general motors electric division.The quality of this machine surpasses anything I have ever seen.You can down load a parts manual form www.owwm.com/pubs/808/2253pdf.